Apnea-Hypopnea Index (AHI) measures sleep apnea severity. The AHI is the sum of the number of apneas (pauses in breathing) plus the number of hypopneas (periods of shallow breathing) that occur, on average, each hour. To count in the index apneas and hypopneas, collectively called events, must have a duration of at least 10 seconds. The AHI, as with the separate Apnea Index and Hypopnea Index, is calculated by dividing the number of events by the number of hours of sleep. From the AHI rating chart here, we see that an index less that 5 is considered normal. 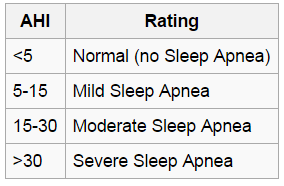 For an Apnea-Hypopnea Index (or AHI) from 5 to 15 denotes mild sleep apnea. Fifteen to 30 is moderate, while a greater than 30 AHI is considered severe. AHI = sum of the number of apneas (pauses in breathing) plus the number of hypopneas (periods of shallow breathing) occurring, on average, each hour. Apneas and hypopneas, collectively called events, must last at least 10 seconds to count as events. The AHI is calculated by dividing the number of events by the number of hours of sleep. What does a Central Apnea Chart look like since that number is not included in the AHI number? Paula, it will take time for your apneas to start to decline. Your brain is still getting used to having air at night. I started my bipap last April, and after about a month, I was still getting 13 apneas an hour, but more alert and awake during the day. After a couple more months it dropped to 10, and after 8 months, I now average around 6.5 per hour. Still having good nights and bad, but that is part of the process. Hang in there. What is the difference between AHI and RDI (respiratory disturbance index). I did some basic research and it seems like RDI is considered “more accurate” but the clear differences are not elucidated very clearly. Any small clarifications would be greatly appreciated. Is .5 and 5 the same measure? What does it mean when your number increases from .5 to 1.0? The decimal point is confusing. Where do these numbers fall on the chart from normal to severe? I was diagnosed with sarcoidosis about 7 years ago. I immediately fought against EXTREME fatigue. My pulmonary doctor recently told me that the sarcoidosis has been in remission for a couple of years now. I went and had a sleep study done. It revealed that I had 131 episodes an hour. Oxygen dropped as low as 60 and I stopped breathing up to 32.5 seconds. The doc said I am basically not sleeping at all. I got my CPAP machine and the next morning I felt so refreshed. It’s scary to think about how long my cells may not have had an opportunity to rejuvenate. I pray that any damage can be reversed with dedicated use of the CPAP machine. I received a nasal mask, and was asked if I wanted a chin strap. I was told if I snored and breathed through my mouth, it wouldn’t do any good. I took the chin strap, but went without the first night (last night). My AHI over 10 hours was 3.9, so I’m thinking I don’t need to use it. What do you think?